Nestled into the Pop-Ups of the Mayacamas mountain range: Keever Vineyards is perched in the hills just southwest of the town of Yountville. We jokingly refer to ourselves as a stealth winery. The entire parcel is 21 acres of mostly rocky hillside. We have a small winery, cave and about six and a half acres planted to vines. Much of the property has been left as native woodland and is home to deer, foxes and red tailed hawks. Four clones of Cabernet, and just a little Sauvignon Blanc: Our property is planted to four clones of Cabernet Sauvignon, each on rootstock specifically bred for rocky hillsides. We have two classic clones, 7 and 337, as well as some of the oldest ENTAV 191 and 341 clones in the Napa Valley. At the very top of our vineyard is a small block of clone 1 Sauvignon Blanc. 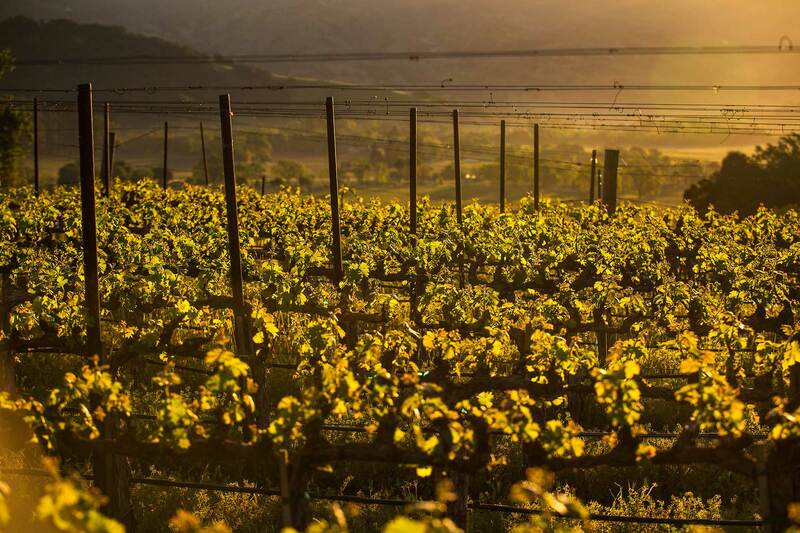 Bathed in the morning sun: Our vineyards face east and enjoy catching the first rays of the morning sun. The vines are trained as bilateral cordons. As the vines grow in the spring, the fruiting canes are tucked into trellising wires so they go upwards. They become neat and tidy walls of green leaves. Each row is trained so that it does not shade the row next to it. When the Late afternoon (early evening) sun is at its hottest, our vines have already fallen into the shade of the hillside, saving our precious grapes from becoming raisins. This gives us a longer ripening season to get the most mature flavors from our vines. Blocks that wind in and out of the hillside: Our vineyards follow the natural contours of the land. They begin about 300 feet above the valley floor and descend the knolls, bowls and hillsides that make up our ranch. Our vineyard crew walks the blocks and assesses each of our 10,000 vines continuously during the growing season. They may remove leaves, drop fruit, adjust the trellising, apply bird netting, or any other measure necessary to ensure that we get the highest quality crop possible in each and every year. Dirt that practically has our name on it: We have said it before, and we will say it again, we love our dirt! Our ranch is planted on soil that is gravelly clay loam. If you are picturing something akin to potting soil, think again! Our vineyard sits in rocky soil that has eroded from the hillsides over millennia. Our vines fight their way through softball sized chunks of rock – and the harder the vines work, the more intense flavors they produce. In a moment of true serendipity, we found a Napa Valley soils map from 1933. There is a name for the type of soil we are planted on. It’s Keefers Series! We feel like this ranch was meant to be ours!